In this paper we draw attention to the important role technology plays in co-mediating institutions, opening up some courses of action and closing off others. Irrigation studies generally recognize the importance of institutions in making technologies work, but tend to take the precise functioning of institutions for granted. Studies that analyse institutions often do not pay enough attention to the mediating role of technology in allocating benefits, risks and burdens. We show in this paper that (irrigation) institutions are moulded by and come about through the interactions between the technical and the social in dynamic and often contested processes of adaptation to changing environments. We argue that a critical understanding of what institutions do requires more explicit and detailed attention to technologies. We base this argument on a detailed historical analysis of the functioning of Seguia Khrichfa, a farmer managed irrigation scheme in Morocco. Through time, irrigation institutions in the Seguia Khrichfa have undergone transformations to match the changing demands of a heterogeneous and growing group of irrigators, an increased command area and changing cropping patterns, and the introduction of new technologies such as drip irrigation. These institutional transformations consisted of recursive cycles of modifications in technological infrastructure and the rules of allocation and distribution. Technical adaptations prompt alterations in the water rotation schedule and vice versa. We anchor our case in descriptions of a specific technology that played a crucial role in co-steering institutional change: the introduction of open/closed gates. Our analysis of the co-evolution of society and technology in shaping institutions in the Seguia Khrichfa shows how technologies become enrolled in (sometimes implicit) processes of re-negotiating relations of authority and responsibility while obscuring institutional politics. The first impression one gets when visiting the Seguia Khrichfa irrigation system in Northwest Morocco is that it is a place of tranquillity, tradition and harmony. One sees a well-maintained canal, filled with clear irrigation water (potable, as the water users will proudly add) from the Bittit springs. One may run into one of the canal operators on his bicycle, chatting with farmers waiting for their irrigation turn. When the visit takes place just after the harvest of wheat in June, one sees sheep and goats grazing the wheat stubbles in the fields. It is also the time when some farmers will plant tobacco, standing with their feet in the wetted fields. On adjacent fields, bright green onion plants will be growing and further away one will see fruit trees full with almost-ripe fruits. The Seguia Khrichfa winds through this restful landscape. It has irrigated the fields already for a hunderd years or more, as the president of the water users’ organisation will explain. The only thing that seems not to fit the rural idyll are the black, plastic drip irrigation pipelines on several fields. Drip irrigation is generally associated with private groundwater wells and high-value crops, rather than with collective surface water systems and family farming. These modern irrigation artefacts therefore appear to belong to a different and more modern agricultural era, one centred on profit-making individuals competing with each other rather than on collaborating farmers who enter into mutual agreements to share available resources among themselves. Yet, both farmers and engineers referred to the introduction of drip irrigation as yet another manifestation of the modernity and success of the Seguia Khrichfa. This paradox forms the starting point of this paper. We use the technology as an entry point to trace and analyse the functioning of institutions for sharing and managing water. We show that the Seguia Khrichfa is not as stable and harmonious as it may seem at first sight. Rather than a radical break with unchanging traditions, the contemporary changes in Seguia Khrichfa around the introduction of drip irrigation form part of a long historical sequence of sociotechnical modifications. These new technologies were mixed and blended in flexible and seemingly easy ways with old canals and water sharing practices in response to changing conditions. Indeed, the durability and success of Khrichfa appears to lie in its ability to continuously adapt to changing circumstances: variable annual rainfall patterns; varying spring discharges; new crops with new water demands; new irrigators; new technologies. One important objective of these adaptations precisely is to maintain (an appearance of) harmony and social order and the avoidance of open struggles. Water users in Khrichfa are a heterogeneous group, comprised of farmers of different ethnic origin, settlement histories and land-tenure status (landowners and sharecroppers). These, combined with differences in the location of one’s plots along the canal (head-end or tail-end) and the fact that there is not enough water in the canal to irrigate all land – with only a quarter of the land that can be irrigated with the available canal water – creates a potentially fertile ground for competition and conflict over water. Yet, although each modification in the water distribution entails (sometimes subtle) shifts in relations of power and authority between involved actors, irrigators in Khrichfa rarely directly confront each other in explicit disputes (Abdellaoui 2009). Instead, and as our study shows, in the Seguia Khrichfa irrigation system, conflicts and struggles are dealt with through frequent interactions, often by encapsulating or absorbing them in continuous social and technical negotiations and adaptations to the system. We use our analysis for a reflection and discussion on how to understand institutions. We make two points. First, our analysis suggests that institutional rules are not just social, but are also expressed in technologies and infrastructures. Tracing the many changes that the irrigation system went through in the last decades illustrates how institutional changes happened through mutually dependent modifications in technologies and rules. Neither the technical nor the social are fixed, but co-shape each other in recursive and often contested processes of socio-technical re-ordering. Second, following on from the early observations of Geertz (1972) based on his comparison of irrigation institutions in Bali and Morocco, we put forward the suggestion that what institutions are and what they do is intimately linked to the types of distributional dilemmas they have to deal with. In the next section, we discuss possible ways to understand the relation between resources, social organization and technologies, and propose ways to link these to critical institutionalism. We proceed with a detailed description of a number of key socio-technical changes in Seguia Khrichfa which illustrate that the institutional efforts to maintain cohesion were simultaneously social and material, with new or adjusted technologies prompting new allocation practices which in turn required new forms of discursive legitimacy. We finish with further reflections on how to understand the material of the social in critical institutional analyses: how to capture the role of (changing) technologies in justifying, modifying or ‘fixing’ relations of authority and responsibility in natural resources management? Irrigation institutions form, and are formed by relations between different actors. They form an important part of the bundle of arrangements through which the distribution of water is regulated, defining not just whom is entitled to how much water when, but also stipulating who can make these decisions and on what basis (Zwarteveen et al. 2005; Zwarteveen and Boelens 2014). These institutions comprise formal rules, organisation and authorities but also consist of implicit, less clearly defined norms and rules (Cleaver 2012). Because they deal with distributional questions, which are inherently contested, irrigation institutions are intrinsically political and often reflect and shape social relations of power between users (Leach et al. 2010; Cleaver 2012). Explicitly acknowledging the political and contested nature of institutional arrangements draws analytical attention to how institutional frameworks and relations need to be constantly re-confirmed and re-negotiated. Such negotiations can be openly confrontational, but can also consist of more subtle processes consisting of different strategies that are partly bounded by technological and institutional path-dependencies or cultural preferences. Recognition of the important role of technology in mediating and co-constituting distributional choices in water management is not new. Starting in the 1980s, social studies of irrigation highlighted how social arrangements interact with the physical infrastructure to create particular distributional outcomes. Social scientists drew attention to the importance of ‘the social’ for explaining what technologies do as part of attempts to change a hitherto predominantly technical irrigation profession. Central to this body of work was an understanding of “irrigation management as a socio-technical process consisting of a technical infrastructure and an institutional framework which determines the use of that infrastructure” (Uphoff 1986), an understanding which was developed and tested through meticulous studies of farmer managed irrigation systems (Coward 1980; Martin and Yoder 1986; Pradhan 1989; Ostrom 1992). Likewise, in Morocco, Pascon (1984) insisted on the need for “soft technology” when intervening in the hydraulic infrastructure of farmer managed irrigation systems, in order to have the “least injuries in the social fabric” of the communities concerned. Many social scientists thus ‘talked to’ engineers, to make them aware of the social and political choices that their designs embodied. Here instead, we want to use insights from the institutional contents of technology to draw attention to the ‘material of the social’: how are institutions simultaneously social and technical, and how can recognition of the ‘also-technical’ character of institutions contribute to critical institutionalism (Cleaver 2012)? Two schools of thought have provided important sources of inspiration to grasp the simultaneously social and technical character of irrigation and water management (Mollinga 1998; Bolding 2004): the Social Construction of Technology school (SCOT) (Winner 1986; Bijker and Law 1992) and actor-network approaches (ANT) (Latour 1987; Law 1992). The basic premise of both theoretical approaches is that technologies do not only mediate people’s relationships with bio-physical processes, but also shape the social (people-people) relationships that co-structure how resources are controlled. Rather than looking for intrinsic characteristics of either the technology or the institutions, scholars working in these traditions direct the attention to the interactions between people and technologies (Bolding et al. 2000) to explain the durability of systems and the actual water flows and distributions that they produce. More generally for water, a recent stream of mainly geographical scholarship echoes notions of socio-technicality to express that the boundaries between nature, technology and society are never pre-given, but themselves the effect of the hard construction work of the actors involved, and of particular political histories of struggles over water (Swyngedouw 1999; Bakker 2010; Mollinga 2014). Particularly influential are Actor-Network approaches, which treat all elements in a socio-technical network as relational. These are subject to re-ordering and thus ‘potential sites of struggle’ (Law 1992, 386). In explaining how heterogeneous networks of human and material elements become patterned, these approaches do not a-priori reserve a shaping role to humans (Law 1992). One important implication of sociotechnical approaches for understanding institutions is that the rules and the organization of rules existing at a particular point in time cannot be taken for granted: they exist through the various networks of which they form part, and require continuous work to re-assert boundaries, relations and rules. Acknowledging this dynamic aspect of socio-technical networks implies that institutions cannot be approached from a single point in time. Instead, the focus shifts to how connections and patterns (re-)order the everyday practices of actors in never-ending processes. Material substances – technologies and infrastructural lay-outs – partly reflect and co-shape (the outcomes of) these processes. Another interesting insight of Actor-Network approaches is that the work that has gone into making a technology tends to disappear once it is working – a process called ‘black-boxing’: all that remains is a ‘matter-of-fact’ artefact (Law 2009; Heeks 2013). This also means that ‘unpacking’ the technology (tracing the networks that made it possible and that constitute it) is an important methodological strategy for understanding and making visible the distributional choices that it helps producing (Veldwisch et al. 2009; Heeks 2013). We primarily based our investigations on around one hundred semi-structured interviews with water users and managers; repeated observations of water user – canal interactions; and participations in and observations of irrigation management activities during more than one year of intensive fieldwork (2012–2013). A typical semi-structured interview for this research included close observations of, and discussions about, the technology together with the informant. Asking questions about the material traces of other times, for instance, proved a fruitful strategy for invoking vivid memories of the social organization of the past. The Seguia Khrichfa is a secondary canal of the Ain Bittit irrigation system, located in the Saiss region (Northwest Morocco). Ain Bititt can be characterised as a farmer managed irrigation system, but it has benefitted from frequent state interventions. The Bittit springs (Ain meaning spring in Arab) provide water to five secondary canals, amongst which is the Seguia Khrichfa (Figure 1). The Seguia Khrichfa brings water to three small villages (douars): Ait Moussi, Ait Amar and Ait Brahim. Dealing with change is a major characteristic of the Seguia Khrichfa. The water users are used to variable rainfall patterns (both within the year and over the years), which require adaptations in irrigation applications. Besides climatologic uncertainties, there are many other changes and dynamics that require the Seguia Khrichfa to continuously adapt. The available water in the canal, for instance, fluctuates as it is a proportion of the variable discharge of the springs. Water availability in the canal also depends on how much spring water is used by others. Also, the number of parcels to be irrigated differ each year, requiring creative ways of sharing the available water. In 2013, the total area of Khrichfa that could potentially be irrigated covered 400 hectares. Yet, the canal discharge of ca.100 l/s only allowed irrigating a quarter of this area. Another major institutional challenge in the Seguia Khrichfa is to accommodate a growing group of water users of changing composition. The number of water users is growing because water users sub-divide water and land among large numbers of heirs and because new people settle in the area. These new people clear land adjacent to the existing command area and hope to be granted access to the water of the canal, thus creating additional demands to an already limited availability of water. The group of irrigators is very heterogeneous in terms of ethnic origins and land tenure status. In addition, crop-preferences continuously change and the water service thus has to accommodate changing cropping patterns. A last important source of change stems from the historically strong relations that exist between the irrigation system and the Moroccan state, resulting in state-sponsored technical interventions that transform the irrigation system, including its technologies, its water distribution and the organisation of water users. The capacity to continuously adapt to all these changes is perhaps the most important characteristic of the irrigation institutions in Khrichfa. The often-heard answer of Khrichfa water users when asked for the reasons of a particular change, is telling in this regard: “il faut bouger,” one needs to keep moving. It is clear that changes also redistribute water and power, and that different people strategically manipulate to steer such re-distributions in their favour. Yet, what is remarkable is the near-absence of conflicts or struggles, of open confrontations and clashes. There are many tensions in Khrichfa, for instance about the competition over water (rights) with other water users such as a downstream irrigation community and the drinking water provider of Meknes (who makes use of the same springs), or about the distribution of water between sharecroppers and landowners, who depend on each other for their existence in agriculture. These tensions, however, seldom erupt in the form of open confrontations or struggles. Geertz characterised co-operation around water in the Moroccan irrigation systems he studied as happening in an “agonistic sort of way” (Geertz 1972, 32): he noted that institutional efforts are geared towards avoiding that the inevitable competition over water leads to exclusions, struggles or open conflicts. Actively maintaining an appearance of a well-functioning FMIS government is also very strategic in view of increasing chances of obtaining public projects and support to the area. The history of Seguia Khrichfa is marked by the establishment of water rights to the Bittitt springs, from which it draws its waters. The administration proportionally divided the rights to the Bittit springs between the city of Meknes (for drinking water) and two ethnic tribes, Ait Ouallal and Ait Ayach during the French Protectorate (Abdellaoui 2009). The Seguia Khrichfa is a secondary canal that serves part of the Ait Ouallal tribe. Water tenure is governed by a combination of collective and individual rights: at the system and canal levels, the management of the irrigation water is a collective affair of the community. Underneath this collective management, water is also the object of what resembles private ‘ownership.’ Geertz expressed this ownership as “something which one can possess only as an agency, not as an object, but no less firmly for that” (Geertz 1972, 32). All that an individual possesses is not substance, but rather a relationship (in time) with other users (Hammoudi 1982) where water rights are “confined and limited in a complex system of social relationships” (Mahdi 1986, 182). Ownership in the Khrichfa canal refers to the right to use a certain proportion of the available flow in the canal for a certain time. In operational terms, ‘ownership’ is the number of hours someone is entitled to irrigate per ‘turn.’ As the amount of water is not sufficient to irrigate all plots simultaneously, the total water flow is divided in sequential time-slots (‘turns’), a rotation schedule that determines which plots are to be irrigated when. Each ‘owner’ thus gets a number of irrigation turns, and the number of hours determines when and how long he1 can irrigate per turn. The period between two turns depends on the total number of irrigation hours that the water users collectively own. In the Seguia Khrichfa, water and land ‘are not married’ as the expression goes; one can inherit, buy, hire, exchange or borrow water from an owner, independent from land ownership. Most water users of Khrichfa own, or work on, several plots located in different places along the canal. They themselves can choose where to use their irrigation hours in the most strategic way. They often do not ‘own’ enough water to irrigate all their plots, as the total irrigable area of the Khrichfa irrigation system is greater than the discharge that the canal can cover. The fact that water ‘ownership’ is unrelated to land ownership also implies that it is possible that someone owns water without land. The irrigation schedule is updated and agreed upon at the start of every season, based on the water right transactions of the past season and the location of the plots that right holders wish to irrigate. 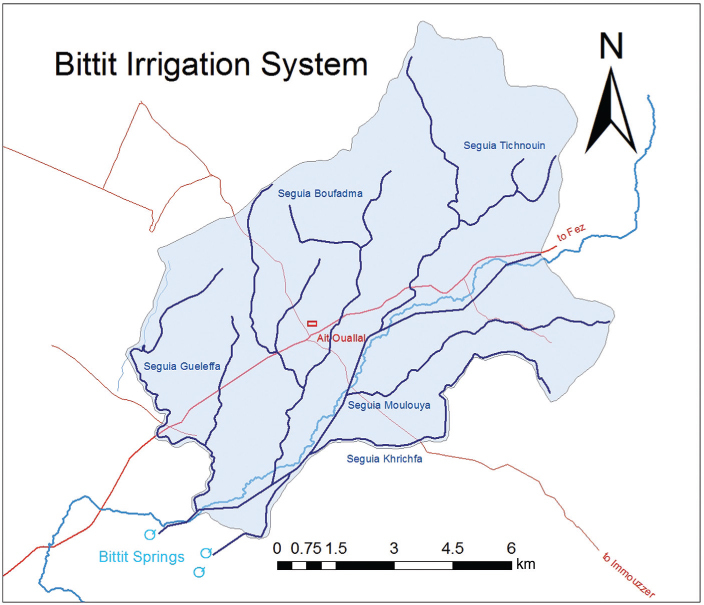 The members of the secondary canals of Bittit are organised in Water Users Associations (WUA), which are managed by a board of six elected members and one board member appointed by the State. Created in 1996 in parallel to existing and less formal irrigation institutions (jmaa), the Khrichfa WUA only became really active in 2004 in response to the increased tensions about water distribution. Before that, water right holders would only come together once a year before the start of the irrigation season to discuss the annual irrigation schedule, and entrust water distribution to canal operators (waqqaf). Much responsibility and power for everyday water management thus lay with these canal operators as they implemented the water distribution, creatively operating multiple arrangements to deal with change (see Hammoudi 1982). During the French Protectorate, the Ait Ouallal pastoralists living in the area received more water than they needed to irrigate their food crops (such as cereals and maize for own consumption). The relative abundance of water attracted settlers from other regions. Most of them entered into sharecropping arrangements with the Ait Ouallal landowners to engage in tobacco production. While the sharecroppers worked the land, the Ait Ouallal landowners identified themselves as pastoralists. Gradually, lands that were situated outside of the original irrigated area were also taken into production by the increasing number of sharecroppers, thus increasing the competition over water. Prevailing sharecropping arrangements stipulated that the landowner provided water and land, while the sharecropper contributed labour. The ‘ownership’ of water thus stayed with the Ait Ouallal landowners. The owner of water paid the canal operator, which gave the water ‘owner’ the right to influence the canal operator and discuss and decide about how the water distribution executed by the canal operator should happen. Sharecroppers had none of these rights, even though they were the actual irrigators and thus had to activate the water rights of the landowner to make use of it. Especially in the village Ait Amar, sharecropping activities appeared successful with plenty opportunity for agricultural extension. The inhabitants of Ait Moussi, located in the head-end of Khrichfa and close to the communal grazing lands, continued with pastoral activities parallel to farming. In Ait Brahim, the tail-end village, land tenure was importantly shaped by the colonial farms, where the farm owners worked with labourers rather than sharecroppers. Nowadays, Ait Amar is the largest village along the Khrichfa canal, and has the largest number of right holders to Khrichfa water (219 from the total 309 right holders). Sharecropping can be financially risky for a landowner, and some landowners failed in making enough profits, which obliged them to sell their livestock. While recalling this, Hmidou, a sharecropper in Ait Amar, explained (19-07-2012) with pride the humiliation of an Ait Ouallal landowner who came to his father (the sharecropper) as he needed a sheep to celebrate a marriage. The landowner asked his sharecropper to provide him with a sheep in exchange for a small parcel of land – thus reversing the relation between the two. Other landowners obtained high profits from sharecropping arrangements, which gave them the possibility to send their children to schools and universities in nearby cities. Many of the second generation educated landowners moved to cities, where they often obtained government positions, which they used to channel support and resources back to their native communities. The Ait Ouallal community thus benefitted from many projects, including the introduction or improvement of electricity, schools, infrastructure and irrigation. Sharecroppers attempted to re-negotiate their relation with the absentee landowners by buying small parcels of often marginal land to construct their own houses or produce their own crops. Some also bought water in small quantities (e.g. 15 min) to obtain the right to participate in decision-making on canal management and to control the actual water distribution of the canal operator. The Seguia Khrichfa thus serves a diverse and heterogeneous group of water users. Although tensions exist between the different groups, they do need each other for continuing their agricultural activities or to maintain and materialize their water rights. Here, we show how the dynamic relations between absentee landowners, landless sharecroppers and the three different villages were importantly co-shaped by technological transformations in the Seguia Khrichfa. We do this by telling the story of one specific technology: offtakes with open/closed gates. We first describe the process that led to the choice for these proportional gates, and analyse what this choice entailed in terms of institutional modalities for distributing, accessing and controlling water. In the early 1970s, the agricultural ministry selected Ain Bittit for a World Bank financed rehabilitation project (Bazzi 1987). It may have been chosen for technical support because it was already known by the agricultural ministry as it shared the spring water with the drinking water provider of Meknes, and because several Ait Ouallal landowners worked for the State. The project, implemented in 1983, consisted of the lining of the earthen secondary canals of the irrigation system. The engineer who designed the lined canals based his calculations on the 1949 water allocation as registered during the French Protectorate: each secondary canal was entitled to a certain proportion of the total spring discharge, expressed in shares.2 The size of one share was based on an engineering rule of thumb, the ‘main d’eau’: the flow of water that one farmer can handle, 20–30 l/s. The number of shares per secondary canal depended on the total number of ‘owners’ along the canal. The Seguia Khrichfa received three shares, in theory enabling three farmers to irrigate at the same time. However, due to ever-increasing numbers of water users, who gradually extended the canal’s command area, there was more and more pressure on the available water. 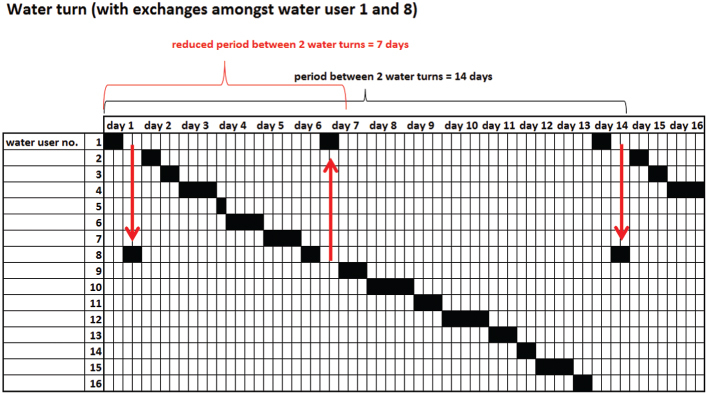 As a consequence, the duration of the interval between two water turns increased to sometimes more than 14 days. This led to disputes among farmers about the appropriate interval between two turns, disputes that originated in a lack of clarity about the number of people that were entitled to a share of the Seguia Khrichfa water. For example, had the appropriators of the previously French farms in Ait Brahim also obtained the water rights of the French land owner, or should these water rights instead be returned to the villagers of Ait Brahim, from whom the French had taken the rights in the first place? The offtakes that the engineer designed as part of the rehabilitation project were gate-controlled circular orifices. These orifices consist of circular openings in the canal wall that can be opened or closed. The discharge that flows through the orifice is related to the difference in water height upstream and downstream of the opening (Figure 2). According to the engineer’s calculations, if three farmers would open these orifices at the same time at their respective offtakes, they would each receive 20–30 l/s (the precise amount depending on the actual discharge of the springs), equivalent to the calculated ‘main d’eau.’ If more farmers would open their gates simultaneously (which was not the intention of the engineer), the water height in the canal would reduce, thereby lowering the off-taking discharge flowing through each orifice (Figure 3). These new gated orifices had important implications for how disputes over the sharing of water played out. As the orifices were located in the canal wall below the water line, they were invisible, making it possible for irrigators to tinker with their gates without being easily found out by others. In principle, only the canal operator had the power to control the use of the orifices, as he was in charge to guide the water from one water user to another and to distribute it in three equal shares. However, it was impossible for him to simultaneously control all the orifices along the whole length (7 km) of the canal. Some water users made use of the invisibility of the offtakes by secretly enlarging their orifice to create a higher discharge. At some places, farmers created their own, new offtakes by making openings in the canal wall. Over time, some orifices could not be properly closed anymore, resulting in water continuously flowing through these openings when there was water in the canal. Together, all the ‘leakages,’ informal offtakes and increased discharges in offtakes in the upstream part resulted in a severely reduced availability of water for the downstream water users, located at the end of the canal. Some farmers remedied this by blocking the canal downstream of their offtake, increasing the water height at the offtake and thus the amount of water received. All this tinkering with the offtakes also led to a gradual deterioration of the infrastructure. An MSc thesis in 1987 thus concludes: “The hydro-agricultural infrastructure of the Bittit irrigation system, constructed in 1983, is in a deteriorated state. The lined canals are broken, the off-takes are destroyed and the gates are lost.” (Bazzi 1987). In 1992, the Regional Directorate of Hydraulics proposed a solution to the water distribution problems in the canal, by suggesting the installation of three open/closed gates after each offtake, and removing all the orifices. From now on, these simple offtakes had gates that were either completely open or completely closed, hence the name: ‘Tout Ou Rien’ (T.O.R. ), ‘all or nothing’ gates. All intakes – a total of fifty intakes in the main canal and in the major secondary canals – were replaced by new division boxes with four T.O.R. gates each. In contrast to the hidden orifices, the T.O.R. gates made the proportional division of water in three shares (again) clearly visible to users, with the water flow visibly divided in three equal shares. The system was relatively straightforward and easy to operate (Figure 4). The T.O.R. gates made the water distribution transparent and less sensitive to tampering. At any point in time, visual inspection of how water is divided was possible. This allowed irrigators to hold each other accountable for when and how much they irrigated. Although the canal operator was still needed to indicate when a water users’ turn would start and end, the T.O.R. gates prompted farmers to monitor water distribution themselves. Irrigators, especially from the tail-end villages, often irrigated with two family members: while one was irrigating, the other would monitor the canal to make sure no other farmer was taking water out of turn. The technology thus prompted a decentralization of the control over water distribution (from just the canal operator to all water users), by allowing irrigators to themselves check if water division happened according to the agreed rotation schedule. The increased transparency of water division also made it possible to make changes to the rotation schedule: it was no longer necessary for farmers with neighbouring fields to irrigate simultaneously (which was the case at the time of the circular orifices, with the canal operator having to keep an eye on the open offtakes), but turns could be distributed to any potential field along the canal. In 1996, some farmers started to make creative use of this possibility, as they wanted to shift from tobacco cultivation to onion production. Exchanging water was made possible because of the T.O.R. gates, as these enabled splitting the water turns amongst plots that are located far away from each other. From 1996 till 2004, more and more farmers started cultivating onions and exchanging water. However, for water users with a short water turn (many of whom were sharecroppers) – for example half an hour – it was not possible to engage in these water exchanges, as it would make their already short turns too short to manage. Also farmers in the tail-end village Ait Brahim, where the discharge in the canal was considerably lower and who had less contact with other users along the Khrichfa canal, did not join the exchange system. Thus, T.O.R. gates enabled some water users to participate in the beneficial exchange of water turns, but not others. The unequal possibilities for exchanging water turns were not the only source of tension along the canal. Also other inequalities caused frictions, e.g. between head-end and tail-end or between landowners and sharecroppers. These frictions led to disputes, and complaints to the local and provincial authorities. These finally prompted an institutional adaptation, consisting of the revival of the WUA in 2004. The WUA had officially been created in 1996 by the State, but it had never been an important body for decision making as water users continued to rely on existing forms of organization with the canal operator for water distribution. The revival of the WUA happened with the help of the caid, the local authority. In order to ease the tensions in the community, the caid enforced a voting system for all water users (and not just for water right holders) during the general assembly. The water users strategically proposed board members and lobbied for votes so that all interest groups would be represented. This resulted in the appointment of a retired technician from the agricultural extension service (originating from the group of Ait Ouallal landowners) as president of the WUA; the appointment of two sharecroppers (one of them had been canal operator, the other was part of the largest sharecropping family) and a newly installed investor with political connections as the other members of the board. The water users had high expectations that this new board would help solve the existing problems and tensions. Especially the new president was mentioned by many water users as a key person in the new board. He represented different user groups, as he was born in Ait Amar, while his mother originated from Ait Brahim. During his work for the agricultural extension service he used to advise the Khrichfa water users about tobacco, onion and potato cultivation, and after retirement he still continued to provide advice to farmers. If offered the chance, he enjoys recalling the history of the irrigation system – to us as researchers but also to youngsters in the Khrichfa area. One of the first changes the new board made was to reduce the water turn from fourteen days to seven days for all water users. In addition, instead of giving the water turn to three neighbouring farmers, the new board members decided to divide the irrigation system in three sectors, each irrigating with 1/3 of the total canal discharge (i.e. 20–30 l/s) with a rotational schedule per sector. The objective was to make onion farming possible for all and to reduce the disparity in discharge between head-end and tail-end. The board of the WUA also changed the relation between water users and the canal operator by using the official regulations for water users associations, which stipulate that water users pay the WUA, who in turn pays the canal operator. Before, the water users directly paid the canal operator. Through this change, the WUA increased its own power as an intermediate body with the financial means and authority on water allocation and distribution. The new board of the WUA also decided to employ three canal operators instead of one, so that each of them could distribute one share of the total discharge within one sector of the Seguia Khrichfa. This reduced the area of influence per canal operator. The changes of the intake structures co-evolved with changes that shifted the control over water shares and their distribution from the canal operator to the WUA. The T.O.R. gates decentralized the control over water, and thus made the position of the canal operators weaker. The WUA board made use of these changing relations, and they justified their authority by referring to the national code for WUAs which stipulates that WUAs should assign, and pay for, canal operators. Material changes thus triggered changes within the socio-technical network, creating possibilities for some actors to draw new elements into the network and making their position stronger. Other technological modifications followed the T.O.R. gates. In 1997, a rehabilitation project installed a collective tube-well, which created new modalities of accessing water. This project was the result of the successful lobby of the president of the Ait Ouallal community with the government for a new irrigation rehabilitation project. The project consisted of the equipment of several existing boreholes (once drilled to measure the groundwater level) with pumps. These pumps added groundwater to the secondary canals, thus increasing the water availability. For the Seguia Khrichfa, this created the challenge to combine the existing rotational water supply with an on-demand water source. Through recursive material and regulatory changes, the WUA board made the tube-well fit with the existing seguia system: they increased the height of the canal walls, and proposed a different way of counting the number of shares. While in the past, they counted only three shares, corresponding to the three T.O.R. gates of the main canal, the fourth T.O.R. gate of the off-take was now counted as well. Thus, when all four gates were opened, the canal water would be divided in four shares. The basic idea of the T.O.R. gates remained the same: the water division was proportional and visible to all. This cosmetic increase in the number of shares allowed the tube-well water to be used with the existing technology and within the existing logic of the system. The tube-well created affordable, low-risk possibilities for accessing water, which was particularly beneficial for sharecroppers and irrigators in the tail end as they did not have, or only had few, water rights of their own. Yet, it also created its own, new set of questions: who should or should not be allowed to benefit from the tube-well and the Khrichfa canal waters? The WUA tried to set clear rules. First, it changed the demand procedure for renting out tube-well water: only right holders (who already owned a water turn) were allowed to make a request to rent in additional water. This, however, did not stop several sharecroppers who did not own water themselves to also use tube-well water: they just asked a befriended right holder to make a request on their behalf when they were in need of water. In 2013, the WUA decided to make the tube-well share a part of the existing shares in the rotational schedule, thus making it impossible for non-right holders to get tube-well water. The hiring out the tube-well water also implied that the WUA board became gradually involved in the sale of water, gaining legitimacy for making money from water deals. Through its water deals, the WUA board increased its income, thereby also strengthening its financial sustainability and asserting increased authority in the management of the irrigation system. Inspired by its new and stronger position, the WUA board also started exploring other ways to financially benefit from the canal water. Drawing on efficiency arguments, the WUA board decided to split the canal water in five shares instead of four, which allowed them to reduce the period between water turns (which was beneficial for onion farming) and which allowed the WUA board to rent out additional water. This change was possible because the old division boxes with four T.O.R. gates had been replaced with division boxes with five T.O.R. gates. The division boxes divided the water in the right amount of shares and still allowed the irrigators to use the water anywhere along the canal and to visually verify the water distribution. Not only did the introduction of the collective tube-well strengthen the position of the WUA, it also created new modalities of accessing water. This particularly suited certain water users: sharecroppers who longed for loosening their ties with landowners started renting small parcels, where they began cultivating onions with tube-well water. As the cropping season of onions is short, they only asked a few hours from the tube-well to satisfy their needs. This was much cheaper than buying or hiring surface water rights. In this way, the collective tube-well changed relations between some sharecroppers and landowners. The new modalities of water access (both tube-well water and the additional water from the WUA) significantly increased the water security of some sharecroppers. In 2004 one of them – Hmidou – decided to install drip irrigation on his field. Previously, he could not irrigate this field as it was located above the canal. However, thanks to the pressurized drip irrigation system, and a small basin to store canal water, the water could reach Hmidou’s plot, allowing him to make it suitable for onion cultivation. Others followed Hmidou’s example, and in 2013 four individual farmers and a family cooperative of 30 members thus used drip irrigation systems using canal water. This in turn triggered the WUA to think about the introduction of drip irrigation on a collective basis: another technological change that would go accompanied with changes in the social organization of the irrigation system. The new drip irrigation projects start to set in motion changes in the irrigation system. Rain-fed land uphill is now becoming more and more attractive as it can be irrigated with pressurized drip irrigation systems, while it is cheaper than irrigated land. These lands are also still fertile as compared to the exhausted plots in the irrigation system. In addition, these plots have not been subject to consecutive divisions because of inheritance and are thus larger than the plots within the irrigation system. This shifting valuation of hitherto rain-fed lands also creates shifts in social hierarchies: suddenly the owners of ‘unproductive land’ have ‘land with potential.’ Sharecroppers who had started to buy cheap, ‘unproductive’ land from the 1990 onwards, now suddenly find themselves in a new, advantageous position. The introduction of drip irrigation projects in Khrichfa goes accompanied with yet another round of changes in water allocation: drip irrigation needs a higher irrigation frequency and it can potentially ‘save’ water. To obtain this higher frequency, the drip irrigation owners have constructed basins to store water for some days. In addition, they use a similar trick as they did 15 years ago to create an irrigation frequency that fitted onion farming: they exchange water turns. Drip irrigation is known – and promoted as – an efficient irrigation technology: it allows irrigators to irrigate the same plot with the same crop using less water (van der Kooij et al. 2013). This thus ‘saves’ water, which the water user could potentially use elsewhere. The saved water can be used by the same owner to irrigate other crops with a higher water demand on the same field, or to irrigate new or expanded fields. Because of the profitability of drip irrigation on previously rain-fed fields, the owners of the drip irrigation projects in Khrichfa have all bought or hired more irrigation hours to serve their drip projects, thus putting higher pressure on the Seguia Khrichfa. Yet, the image that drip irrigation ‘saves’ water is pertinent, and creates discussions amongst irrigators: if Khrichfa will get drip irrigation on a collective basis, where will the ‘saved’ water go? Some speculate about a re-allocation of water within the irrigation system (for example, saved water might be used to irrigate all the rain-fed land above the canal, or it could make the cultivation of fruit trees over the whole irrigation system possible). Others are more cautious and pessimistic, and wonder whether the ‘saved’ water will stay with the Khrichfa irrigators, or whether it will prompt a re-allocation at basin level. As the episodes of the T.O.R. gates and the tube-well have shown, the introduction of the new technology may indeed generate unpredictable outcomes, re-patterning the water allocation of the Seguia Khrichfa, creating new contestations or injustices. Our research was triggered by curiosity about the presence of modern drip irrigation technologies in a traditional farmer-managed surface irrigation system. In our attempt to understand this unusual blend of tradition and modernity, we engaged in a socio-technical historical analysis. We aimed at tracing and explaining how Seguia Khrichfa deals and has dealt with ever-changing distributional dilemmas and choices. Our analysis suggests that an important explanation for the durability of the Seguia Khrichfa lies in its adaptive capacity. The history of the irrigation system as told here is a story of how institutions are “patched and pieced together” (Cleaver 2012); a story of institutional bricolage, consisting of repeated ad-hoc adjustments that draw on existing and new forms of social organisation and material infrastructure. It is also a story of changing power relations, in which a heterogeneous and changing group of players continuously renegotiate their respective access to water, as part of and reflecting wider changes in social configurations of mutual dependency. In spite of the increased competition over water, there are remarkably few instances of open struggle over how water is distributed in Khrichfa. Rather than open or violent confrontations, tensions and conflicts are subtly dealt with through almost continuous revisions and re-negotiations about how water is distributed. The importance of negotiations perhaps explains why the most open struggle in the history of Khrichfa was about the right of sharecroppers to take part in them, through votes in WUA meetings. In Khrichfa both availabilities and demands for water are variable and ever-changing as a result of a complex combination of natural, technological and social factors. As a result, the nature of the distributional dilemmas and tensions to be solved also continuously changes. Our analysis shows how technology plays an important role in co-defining both the contents of the distributional questions as well as the types of possible solutions proposed. For instance, the orifices installed during the first rehabilitation project implied a specific way of arranging water distribution through calculated discharges. Many irrigators did not agree with the unverifiable water distribution of the orifices, and tinkered with the offtakes. Likewise, the installation of the T.O.R. gates set in motion a gradual shift in the locus of control from the canal operator to the WUA board. New technologies also evoked new ways of talking about water distribution; drip irrigation for instance comes with a discourse of efficiency, re-framing distribution as partly a question of the avoidance of losses and waste. The need to pipe the water for drip irrigation will also provoke another shift in possibilities for monitoring water flows, and is thus prompting new discussions about distributions of water and authority in the Seguia Khrichfa. Drip irrigation also (again) provokes discussions about whom to in- and exclude in the group of legitimate water users of Khrichfa, as drip irrigation makes it possible to irrigate new parcels of land. Our analysis shows that technological re-configurations and translations may offer elegant and implicit ways of reconciling diverging and sometimes conflicting interests and goals, something that neatly suits the ‘agonistic cooperation’ character of Moroccan irrigation institutions noted by Geertz (1972). Rather than openly articulating and addressing tensions and conflicts in formal spaces for deliberation, proposing new technologies, or enrolling old technologies into new configurations, allows actors to enforce changes in the irrigation system and its management without harming the precarious balance of cooperation and without anyone losing face. In Khrichfa, technological transformations thus serve to conceal or resolve contentious negotiations, altering social relations and agency in non-conspicuous and implicit ways. This potential capacity of technologies for hiding politics, however, is not something that is intrinsic to the technology but the result of the specific socio-cultural relations in which the technology is embedded. In other contexts, rather than helping to hide and solve tensions, technologies may become the (symbolic) representation of differences of interests and conflicts. To draw attention to how institutions are often also technical, we have shown how technology mediates social relations in dynamic and interactive ways. A critical understanding of institutions, therefore, requires opening the black-box of technologies. This goes beyond merely stating that the physical matters (Cleaver 2012), or acknowledging how technologies work. It instead entails acknowledging that technical modifications, innovations and tinkering form an intrinsic part of processes of institutional bricolage. Institutions are continuously evolving socio-technical networks, in which all elements are relational and are thus subject to re-ordering. Here it is important to realize that what technologies do is not necessarily the intended effect of wilful human strategies, but may be an unanticipated effect that emerges once they are combined with other human and non-human elements in networks. 1Throughout the paper, we use masculine terms to refer to farmers or irrigators. This reflects the fact that most people we encountered in the field and in the WUA board, and most of our interviewees, were men. Yet, farming and irrigation crucially depend on the productive and reproductive work of women, and the social domains in which water arrangements happen importantly include the private and family domains associated with women (also see Bossenbroek and Zwarteveen 2015). 2The Arabic word used to express a share of water is fez, which means hoe. This refers to the discharge that one farmer can guide through the fields with a hoe when he irrigates. In Bittit, farmers use this word to express a certain proportional share of the total available water. For the sake of readability and ease of understanding, here we will use the word share. We would like to thank the water users of the Seguia Khrichfa for sharing their practices and experiences with us. We thank the canal operators and the WUA board for their patience in explaining every detail of irrigation in Khrichfa and Rachid for his translation and company. We thank 3 anonymous reviewers, Hermen Smit, Andres Verzijl and Jonas Wanvoeke for commenting on a first draft. This research is made possible by a grant of the Wageningen School of Social Sciences, and is part of the research programme ‘Drip Irrigation Realities in Perspective,’ financed by the Netherlands Organisation for Scientific Research (NWO). Abdellaoui, R , ; Water Allocation Conflict Management: Case Study of Bitit, Morocco. In: Jagannathan, N.V, Shawky, A and Kremer, A eds. , editors. Water in the Arab World, Management Perspectives and Innovations. Washington: The World Bank. 2009. Bakker, K , . Privatizing Water: Governance Failure and the World’s Urban Water Crisis. Ithaca, New York: Cornell University Press. 2010. Bazzi, A , . La Petite et Moyenne Hydraulique au Maroc etude de cas: perimetre de Bittit (Meknes), Genie Rural, Institut Agronomique et Veterinaire Hassan II Rabat. 1987. Bijker, W. E and Law, J , . Shaping Technology/Building Society. Studies in Sociotechnical Change. Cambridge, Massachusetts: MIT Press. 1992. Bolding, A , . In Hot Water, A Study on Sociotechnical Intervention Models and Practices of Water User in Smallholder Agriculture, Nyanyadzi Catchment, Zimbabwe, PhD thesis. Wageningen, The Netherlands: Wageningen University. 2004. Bolding, A, Mollinga, P and Zwarteveen, M , . UNESCO-WOTRO International Working Conference ‘Water for Society’. 2000. Interdisciplinarity in Research on Integrated Water Resources Management: Pitfalls and Challenges. Bossenbroek, L and Zwarteveen, M , ; ‘One doesn’t Sell One’s Parents’: Gendered Experiences of Shifting Tenure Regimes in the Agricultural Plain of the Sais in Morocco. In: Archambault, C and Zoomers, A eds. , editors. Global Trends in Land Tenure Reform. Gender Impacts. Londen and New York: Routledge. 2015. Cleaver, F , . Development Through Bricolage. Rethinking Institutions for Natural Resource Management. London and New York: Routledge. 2012. Coward, W , ; Irrigation Development: Institutional and Organisational Issues. In: Coward, W ed. , editor. Irrigation and Agricultural Development in Asia. Ithaca: Cornell University Press. 1980. Geertz, C (1972). The Wet and the Dry: Traditional Irrigation in Bali and Morocco. Human Ecology 1(1): 23–39. Hammoudi, A (1982). Droits d’eau et societé: la Vallée du Dra. Hommes, terre, eaux 48: 105–118. Heeks, R , . Development Studies Research and Actor-Network Theory. Working Paper Series Actor-Network Theory for Development. Centre for Development Informatics, Institute for Development Policy and Management, SED, Manchester. 2013. Latour, B , . Science in Action. How to Follow Scientists and Engineers Through Society. Cambridge Massachusetts: Harvard University Press. 1987. Law, J (1992). Notes on the Theory of the Actor-Network: Ordering, Strategy and Heterogeneity. Systems Practice 5: 379–393. Law, J , . Actor Network Theory and Material Semiotics. Wiley-Blackwell. 2009. Leach, M, Scoones, I and Stirling, A , . Dynamic Sustainabilities, Technology, Environment, Social Justice. London: Earthscan. 2010. Mahdi, M , . Proceedings of the Conference on Common Property Resource Management. Washington, DC: National Academy Press. 1986. Private Rights and Collective Management [of] Water in a High Atlas Berber Tribe. Martin, E and Yoder, R , ; Institutions for Irrigation Management in Farmer-managed Systems: Examples from the Hills of Nepal. In: Martin, E and Yoder, R eds. , editors. International Irrigation Management Institute Research Paper. Digana Village, Sri Lanka: IIMI. 1986. Mollinga, P , . On the Waterfront. Water Distribution, Technology and Agrarian Change in a South Indian Canal Irrigation System, PhD thesis. Wageningen, The Netherlands: Wageningen Agricultural University. 1998. Mollinga, P (2014). Canal Irrigation and the hydrosocial cycle, the morphogenesis of contested water control in the Tungabhadra Left Bank Canal, South India. Geoforum 57: 192–204. Ostrom, E , . Crafting Institutions for Self-Governing Irrigation Systems. Cambridge, UK: Cambridge University Press. 1992. Pascon, P , ; La PMH Comme Technologie Douce. In: Boulderbala, N, Chiche, J, Herzenni, A and Pascon, P eds. , editors. La Question Hydraulique, 1. La Petite et Moyenne Hydraulique. Rabat, Morocco: Institut Agronomique et Vétérinaire Hassan II. 1984. Pradhan, P , . Patterns of Irrigation Organization in Nepal. A comparative Study of 21 Farmer-Managed Irrigation Systems. Colombo, Sri Lanka: IMMI. 1989. Swyngedouw, E (1999). Modernity and Hybridity: Nature, Regeneracionismo, and the Production of the Spanish Waterscape, 1890–1930. Annals of the Association of American Geographers 89(3): 443–465. Uphoff, N , . Improving International Irrigation Management with Farmer Participation: Getting the Process Right. Boulder, USA: Westview Press. 1986.
van der Kooij, S, Zwarteveen, M, Boesveld, H and Kuper, M (2013). Drip Irrigation Unpacked. Agricultural Water Management 123: 103–110. Veldwisch, G. J, Bolding, A and Wester, P (2009). Sand in the Engine: The travails of an Irrigated Rice Scheme in Bwanje Valley, Malawi. The Journal of Development Studies 45(2): 197–226. Winner, L , . The Whale and the Reactor. London and Chicago: Univerity Press. 1986. Zwarteveen, M, Roth, D and Boelens, R , ; Water Rights and Legal Pluralism: Beyond Analysis and Recognition. In: Roth, D, Boelens, R and Zwarteveen, M eds. , editors. Liquid Relations, Contested Water Rights and Legal Complexity. Location is New Brunswick, New Jersey: Rutgers University Press. 2005. Zwarteveen, M. Z and Boelens, R (2014). Defining, Researching and Struggling for Water Justice: Some Conceptual Building Blocks for Research and Action. Water International 39(2): 143–158. Bittit irrigation system, including the Seguia Khrichfa (secondary canal). Side view of an orifice. The discharge passing through the orifice is a function of the height of the water above the downstream water height (h). When an additional orifice is opened, the water height will lower (dotted lines), thus resulting in a lower discharge through each orifice. Use of the T.O.R. 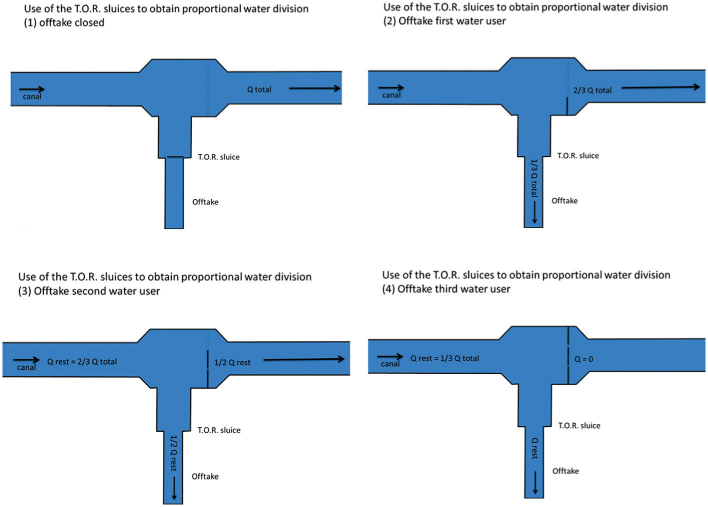 gates to obtain a proportional water division (starting in the upper-left corner, clockwise): 1) offtake of a water user who does not irrigate; 2) offtake of the most upstream irrigating water user; 3) offtake of the second irrigating water user; 4) offtake of the most downstream irrigating water user. The exchanges of water at the Khrichfa canal: water user 1 irrigates with half of his irrigation hours, then gives the remaining water to water user 8. After irrigating, water user 8 gives the water turn to the downstream neighbour of water user 1, thus water user 2.